NASA’s OSIRIS-REx spacecraft has discovered ingredients for water on a nearby skyscraper-sized asteroid, a rocky acorn-shaped object that may hold clues to the origins of life on the earth, scientists said on Monday. 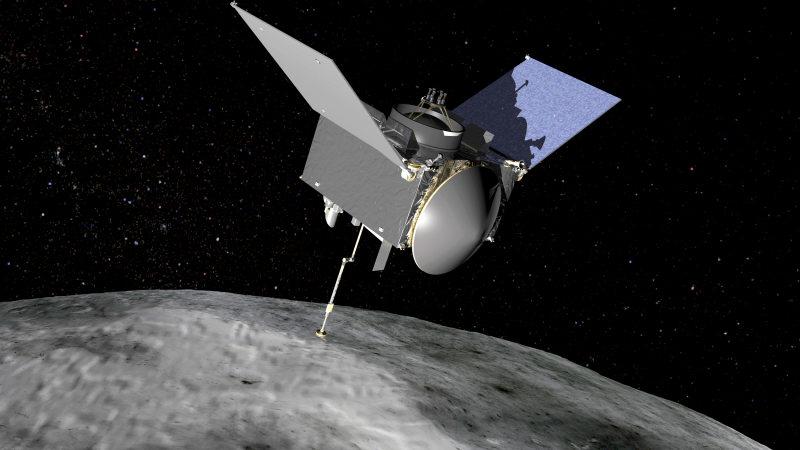 OSIRIS-REx, which flew last week within a scant 19 km of the asteroid Bennu some 2.25 million km from the earth, found traces of hydrogen and oxygen molecules — part of the recipe for water and thus the potential for life — embedded in the asteroid’s rocky surface. Shortly after signs of water was discovered in December and the discovery of the particle plumes on January 6, the mission science team increased the frequency of observations, and subsequently detected additional particle plumes during the following two months. Although many of the particles were ejected clear of Bennu, the team tracked some particles that orbited Bennu as satellites before returning to the asteroid’s surface. Water can be split into its constituent hydrogen and oxygen, the chief components of rocket fuel. This stuff can then be sold at off-Earth “gas stations,” where spacecraft could fill their tanks up on the go, mining advocates have stressed.”For an asteroid miner, Bennu is pay dirt,” OSIRIS-REx principal investigator Dante Lauretta, of the University of Arizona, told Space.com. “That is exactly the kind of target that we want to go to and process [for] a propellant depot that people have been envisioning for the first profitable asteroid mine.”“The discovery of plumes is one of the biggest surprises of my scientific career,” said Dante Lauretta. “And the rugged terrain went against all of our predictions. Bennu is already surprising us, and our exciting journey there is just getting started,” Lauretta said. “Scientists are interested in the composition of Bennu because similar objects may have seeded the Earth with water and organic materials,” said Victoria Hamilton, a mission co-investigator from Southwest Research Institute in the US.In 2020, OSIRIS-REx will touch Bennu’s surface to collect a sample the surface regolith for return to Earth. The spectral measurements used in this study will be confirmed by lab experiments when a sample of Bennu’s surface materials arrives back at Earth in 2023.